Tuomala, M. (2016). 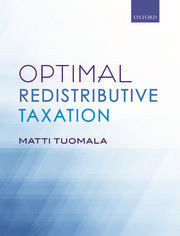 Optimal Redistributive Taxation. Oxford University Press. Lisätietoja täältä. Kirja-arvostelu. Cremer, H. (2017), Book review of Optimal Redistributive Taxation, The Journal of Economic Inequality, Published online 08 July 2017.